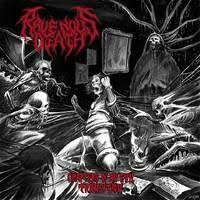 RAVENOUS DEATH is Death Metal dug up from the graves of Mexico and given unholy life. Their official debut Chapters of an Evil Transition shambles forth from its crypt, numb and confused but blood thirsty as it roves through the graveyard, groaning terribly. The album is an unsightly look at the illness that claims the mind either through madness or violence as well as a healthy injection of high-octane nightmare fuel that will leave you clawing the walls in either terror or anger; you get to figure out which. RAVENOUS DEATH is waiting in the darkest of cold recesses of the dilapidated mausoleums they were robbed from and call home. Shrieking into the cold embrace of the night, Chapters of An Evil Transition is a full-length debut that feels right at home with the ghouls and the demons and won’t turn down a party or two with some witches. RAVENOUS DEATH is evil. They make that known about them abundantly clear even in just their singles, “Evil Dementia (The Voices of the Nobodies)” and “Harvesting Hate”. The former of which is a terrible look at the devastation a disease like Dementia wreaks on a person’s mind, leaving what remains in ruin. “Evil Dementia (The Voices of the Nobodies)” is like watching a person physically decay in fast forward, their very identity become more and more distorted and rotting away until there is only skeletal remains left. The explosive power of “Harvesting Hate” is a giant Combine machine reaping infinite fields for sprouted seeds of animosity. And what an abhorrent noise such a machine makes with blast beat pistons and churning cymbal coils. Much like the band’s name, the machine is always feeding, never sated and forever on the hunt for blood. RAVENOUS DEATH is hellbent on sending us to an early grave. Chapters of An Evil Transition come out January 21st.